With Black Friday fast approaching not only is it a good time to be shopping for others, but it is also a great time to score some hot deals for yourself. To be sure you don't miss one of their hot deals when it comes around, Amazon has set up a website hub dedicated to Black Friday and the deals that can be had now, leading up, to and following the Dark Day Of Deals. Amazon's Black Friday hub is also conveniently divided up into categories so tool lovers like ourselves can easily filter down to only the things we want. The best deals will likely be found on Black Friday and Cyber Monday, but Amazon is also planning on running special deals the full week leading up to Black Friday. But you don't have to wait to find great deals. 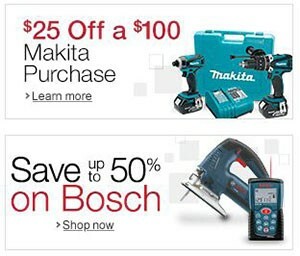 If you head over to the Amazon Black Friday Deals Tool Hub right now, you will see deals for $25 off a $100 Makita purchase, percentage mark downs on Bosch, DeWalt, Stanley and more. A little further down on the page are coupons for everyday item like dust masks, carpet tape, etc. There is even a $25 off coupon for the Rockwell Jawhorse, which brings the final price down to $111.99 (plus tax). Update: The Rockwell Jawhorse $25 Off Coupon is no longer listed on the Black Friday Hub, but it can still be found on the product page here. I should also note that by following Amazon the link below, you will be directly supporting Tool-Rank with your purchases. If you want to go a step further, check out how you can support Tool-Rank at almost any store by using our Bookmarklet.